One of the lessons that I’m learning in my family research is that you never really know everything there is to know about an ancestor – and you cannot make assumptions! And just when you think you know it all – a new record collection pops up on line to shed new light on the life of someone that you’re researching. And so it was recently with my husband’s great aunt, Sallye Emeline Curbow. Sallye is the daughter of Charles Franklin Curbow and Ida Bell Howard. She was born in Denton County, Texas in September of 1913. 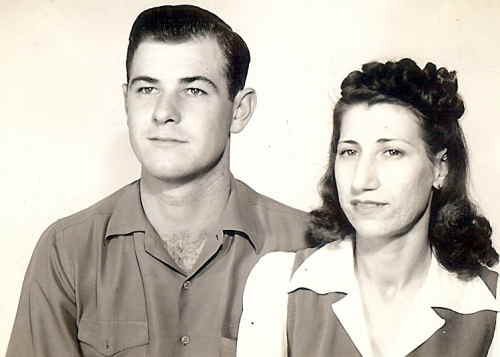 Once her parents divorced, she can be found with her father Charles working at the Texas State Tuberculosis Sanatorium in Tom Green County, Texas. I was unable to locate a Sallye Curbow in the 1940 census – but suspected that she would be near her father Charles – who was still in Sanatorium during that time period. Going through the census for Tom Green County, line-by-line, I did find a Salle E. Ivie employed at Sanatorium. 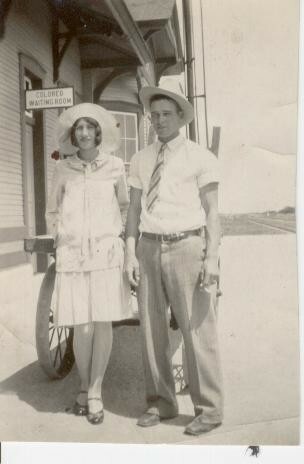 She is 26 born 1914 in Texas; she is married to John H. Ivie; living in Dorm 2 of State Tuberculosis Sanatorium. I had long suspected this was Sallye Emeline Curbow; however, I had no proof of it. Enter the new collection on ancestry.com: U.S., Social Security Applications and Claims Index, 1936-2007 which provides information filed with the Social Security Administration through the application process and sometimes provides valuable details for researchers. In Sallye’s application, I hit the jackpot because when she applied for a Social Security card in August of 1943 – she did so as Sallye Emilline Ivie. Bingo! By June of 1953 her name had been changed to Sallye Emilline Lawson. 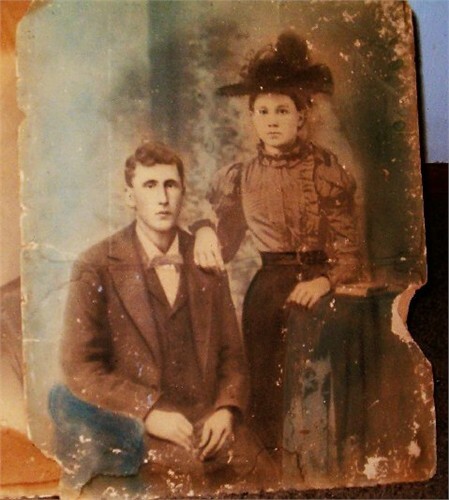 Once the marriage to John Henry Ivie had been established, I began scouring the newly updated Texas, County Marriages Records database on FamilySearch.org and lo and behold, I found not one marriage record – but two marriages for Sallye Curbow prior to her marriage to Frank Floyd Lawson (the only known husband to date). 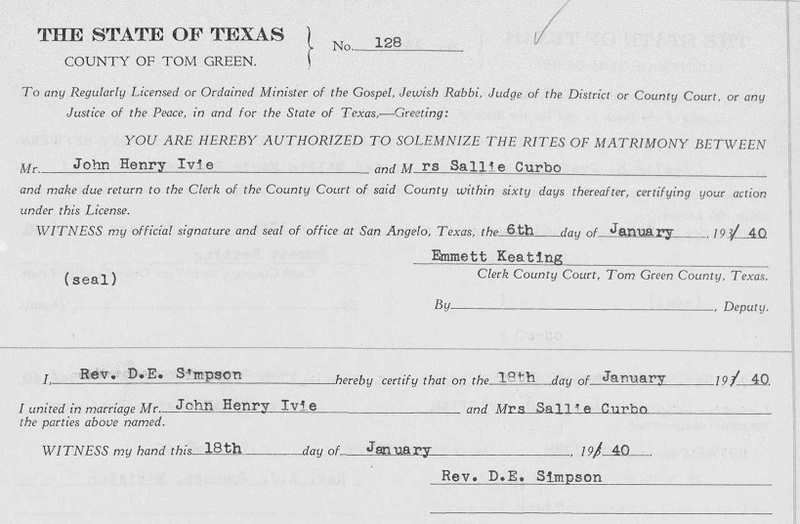 Sallye Curbow was 17 years old when she married 23 year old Sam Barton Collier on 11 Sept 1930 in Tom Green County, Texas. Since she was a minor, her father C. F. Curbow gave permission for the marriage to take place. 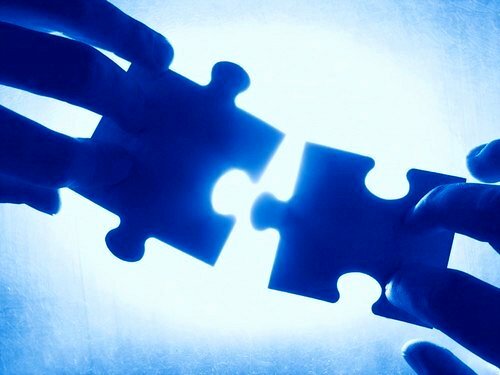 This couple did divorce – and Sam B. Collier married his second wife, Mary Velma Lewis, on 2 Sept 1936 in Tom Green County, Texas – so the divorce took place prior to that date – and probably in Tom Green County, Texas. Mr. Collier was also present at Sanatorium and working as a painter during the 1930 census period, and this is presumably where he met Sallye. Mr. Collier was born to William Christopher Collier (1859-1932) and Virginia Lee (b. 1871) on 16 Jul 1907. He died 23 Aug 1968 in Dallas County, Texas. Sallye and Sam had no children. Sallye Curbow was about 26 years old when she married 18 year old John Henry Ivie on 18 Jan 1940 in Tom Green County, Texas. Likewise, this couple also divorced. When Sallye applied for a Social Security card in Aug of 1943, she did so as Sallye Emeline Ivie. John Henry Ivie marries his second wife, Dortha B. 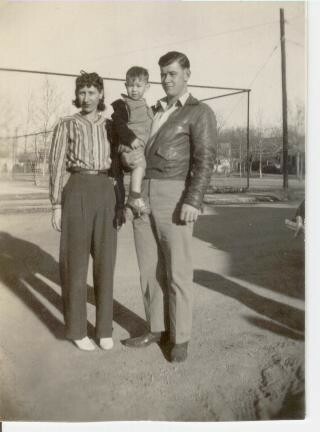 White on 2 Apr 1945 – so the divorce would have taken place prior to this date – probably in Tom Green County, Texas. Mr. Ivie was also present at Sanatorium during the 1940 census period, working as a waiter, and again, this is presumably where he met Sallye. Mr. Ivie was born to Knox Bell Ivie (1894-1978) and Mary Cammie Conner (b. 1897) on 14 Oct 1919 in Angelina County, Texas. He died 18 March 1985 in Tom Green County, Texas. Sallye and John had no children. The photo comes from researcher Ronald James Rodgers. He states that John Henry Ivie was his uncle. His family told him that the photo is John with a “girlfriend” named Lola (last name not known). I strongly believe the woman in the photograph is Sallye Emeline Curbow. What do you think?! This picture (though not great quality) was originally thought to be Sallye with her husband Frank Lawson. Now I feel like it’s probably young Mr. Ivie. What do you think? Sometime prior to June of 1953, Sallye married her third (and final) husband, Frank Floyd Lawson. The date of marriage is only an ESTIMATE – based on Sallye’s U.S. Social Security application where in Jun of 1953 her name is listed as Sallye Emilline Lawson. When Mary Curbow interviewed Bob and Evelyn Horton Stone (close friends of Sallye’s) some years ago, they stated that Sallye and Frank married right after World War II. On Frank Lawson’s U.S. Army enlistment papers – dated 6 Mar 1942 – he lists himself as “married,” this however, could be referring to his first wife, Josephine. The location of the marriage is not known – no record has been located. If the marriage took place in Tom Green County, Texas then it is not appearing in the database with the other two marriages. The more likely scenario is that they met and married in Pecos, Reeves County, Texas – where Sallye is living at the time of her father’s death in August of 1955. Mr. Lawson is the only husband that is not located in Sanatorium, Texas – which also leads me to believe she did not meet him there. Mr. Lawson was born to Frank Isaac Lawson (1888-1973) and Annie Josephine Drake (1895-1982) on 24 Mar 1915 in Bell County, Texas. He died 22 Nov 1980 in Temple, Bell County, Texas. Sallye and Frank had no children. Kudos to ancestry.com and familysearch.org for all the work they do for the genealogy community! Recently I received an inquiry from a fellow Curbow researcher who is just getting started on her family history journey. While this does not pertain to our direct Curbow family line – let’s be patient and take another look. Her Curbow family line starts with Edna Curbow, the daughter of William S. Curbow. William is one of the sons of Wiseman Curbow (brother of our Tilman P. Curbow) and cousin to our Oliver Perry Curbow. I feel that by looking at Wiseman’s family line we could potentially break down some brick walls and uncover some of our own family mysteries. So here we go – the life and times of William S. Curbow: First – I have no idea what the initial “S“ stands for! I have never seen it identified in any record. He was born in Bowie County, Texas. The birth year varies from 1853-1855 in the relevant census records (1860, 1870, 1880, 1900 and 1910) and is confirmed as 1855 in the U.S. and International Marriage Record database . He is the first-born son of Wiseman “Wise” Curbow and Emeline Parker. In 1860 William is with his parents and siblings in Beat 2, Bowie County, Texas – near Boston. Indexed as “Wm Curbow,” 5, born 1855 in Texas. In 1870 William is with his parents and siblings in Precinct 5, Bowie County, Texas. Indexed as “William Curbow,” 15, born 1855 in Texas. 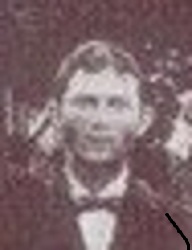 According to the U.S. and International Marriage Records database on ancestry.com, William married Julia R. in 1872 – the location is not listed – but presumed to be Bowie County, Texas. He would have been only about 17 years old. I’m fairly certain this can’t be correct because his wife, Julia Annava Simington, was not born until 1875! Alternatively, it is possible that Julia R., in the database is a different person, and this is William’s first marriage and Julia Annava Simington was his second marriage. This second scenario seems more likely when we look at the 1880 census. He is indexed as “William S. Curbo,” age 25, born in Texas, works on farm. He is living in Precinct 4 of Bowie County, Texas with his wife Julia who is 16 years old – with them is a son named Willie who is four years old. This is either a child from a previous marriage, or Julia gave birth at the age of 12. I find that very unlikely – even in the 1880s! 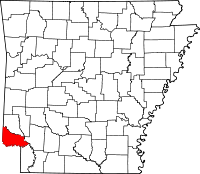 In the 1900 census the family has moved to Little River, Little River County, Arkansas, which I believe borders Bowie County, Texas. William is misindexed as “W. S. Cirsbow,” age 46, born July of 1853 in Texas; farmer. He is living with his wife Julia A., who states that she has given birth 5 times and that all five children are living – Edna, Doely, Ella, Annie and John, which further seems to indicate that Willie (from the 1880 census) is not Julia’s son. All the children were born in Texas – unfortunately no birth dates were listed on the census. The enumerator must have been in a hurry to get home that day ! In the 1910 census the family is still in Little River County, Arkansas. William is misindexed as “William S. Kirk,” age 57 born 1853 in Texas. The mystery of the marriage is solved here – he states that this is his second marriage and that he has been married for 32 years putting his marriage year with Julia Annava Simington at 1878. This also would seem to indicate that Willie (from the 1880) census is the child by his first wife, Julia R. He states that he is a farmer. His wife Julia is 47 years old. Shockingly, in this census she states that she has given birth 12 times and that only 5 of the children are alive. In the home is: Dollie, 17, Anna, 12, Jora, 5. This would mean that she gave birth 7 time between 1900 and 1910 – and seven children died. I have been unable to locate the family in the 1920 census. As far as I have been able to determine – his children were: William D. “Willie Curbow, born 1876; Edna (1882-1917); Dollie born 1893; Ella born ? ; Anna born 1894; and Zola Elizabeth Curbow (1900-1977). If there were other children, they are unknown to me. I also have been unable to locate a death record for William S. Curbow in the Texas Death Index. All of the trees on ancestry.com state that he died in 1923 in Bowie County, Texas. If he did die there in 1923, there should be a death certificate on file; however, I have been unable to locate one for him. It makes me wonder if he died across the border in Arkansas instead? 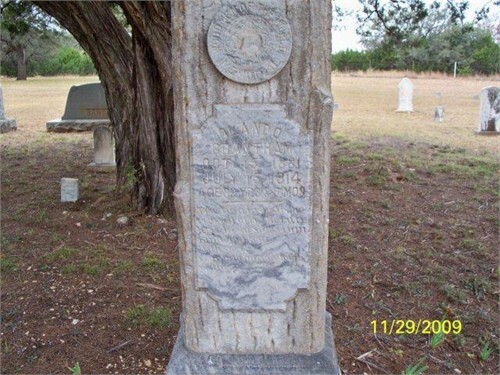 William S. Curbow is laid to rest in the Sand Hill Cemetery in Simms, Bowie County, Texas, which is confirmed by the Find-a-Grave memorial on that website. If I were actively researching this family line, I would contact the Bowie County Clerk’s Office, Bowie County Library and/or the Bowie County Historical Society (I believe they have a very active one) – specifically, I would try to locate the two marriage certificates for William and his death record. If a death date can be determined, I would be scouring the old newspapers for an obituary. Sharon – I hope this gives you a good start on your ancestor. If any other researchers of this family line land on this post, I would be very pleased to hear from you. William David Curbow was the oldest known son of Oliver and Harriet McGuire Curbow – and my husband’s grand-uncle. There is some discrepancy in the records pertaining to his year of birth. His death certificate, compiled from state hospital records, indicates that he was born in 1870 in Denison, Grayson County, Texas. This is believed to be incorrect. 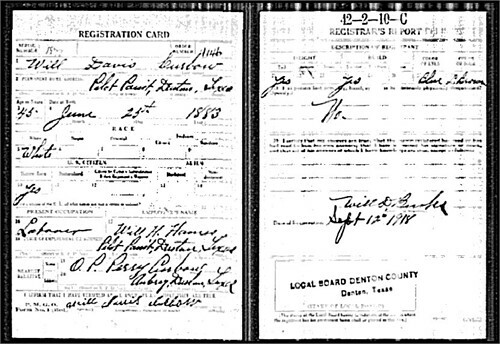 His World War I draft registration card indicates that he was born in 1883. This too is believed to be incorrect. The card states that he was 45 in 1918 when he filled out the card. This puts his birth year at 1873 – which I believe is closer to the truth. For our purposes here, I will use the birth date of 25 Jun 1873. In addition to this, on the Draft Registration Card – he is a resident of Pilot Point, Denton County, Texas, and he lists his middle name as “Davis” rather than “David.” William describes himself as being tall and slender with blue eyes and light brown hair. 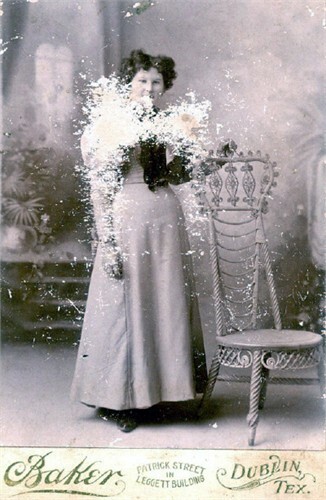 On May 20, 1900, William married Arizona Evans in Denton County, Texas. Arizona was the daughter of Edward Thomas Evans (1831-1897) and Caroline Haseltine Quillen (1845-1928). She was part of a large extended family of 15 children. Her father was first married to Mary Elizabeth Quillen. After Mary’s untimely death, he married her sister, Caroline (Arizona’s mother). The newly weds, Arizona and William, were living with Oliver and Harriet Curbow in the 1900 census record. Unfortunately, Arizona died very young – less than three months after the census was taken. Arizona Evans (misindexed in her marriage record as “Ivens”) was born in Texas in May of 1883 and died on September 20, 1900 in Aubry, Denton County, Texas – very tragically at the young age of seventeen. The oral family history as told by Richard Mercer – Evans’ family historian – tells me that Arizona died in a fire. He further advises that Arizona was fun-loving witty, vivacious and quite beautiful. I agree with him. The photograph of Arizona (right) was taken around 1896, when she is about 13 years old, in Dublin, Texas. Richard further states that Arizona “was buried next to her father on Gene Tatum’s place at a bend in the road they called “Little Tree.” A mention of Arizona’s death appears in the September 27, 1900 issue of the Denton County News: “Mrs. Will Curbo died at her mother’s home here last Saturday morning and was buried at Key Cemetery on Sunday morning.” Find-a-Grave volunteer, Fred Cross, notes that Key Cemetery is on private property and is now in disrepair, cattle roam freely on the property, and have destroyed most, if not all of the tombstones. He was unable to locate a headstone for Arizona. As a complete aside – Arizona Evans had a sister named Cordelia Savannah Evans who married Annias Martin. This couple had a daughter named Bertie Mae Martin – who married John P. Howard – who was the brother of Ida Bell Howard – who married Charles Franklin Curbow – my husband’s great grandparents. Oh the tangled web we weave ! ! And it gets better! Annias Martin (above) had a son named Arthur Powers Martin who was Arizona’s first love! She was in competition for him with Lucy Hatcher, her niece (daughter of James Alvin Hatcher and Martha Ellen Evans – who is actually Arizona’s half-sister) Are you confused yet?! I am! Rich Mercer writes: Lucy Bell (Hatcher) and her young Aunt Arizona both had intentions toward Arthur Martin – and sometimes jealously cropped up between them. This picture was taken the day after the circus came to town. Arthur and the girls were at the circus and he climbed a tent pole then fell right into the girls. The jailer took him away for public intoxication and let him out the next day. When Arthur saw the picture later in life, he told his daughter, Tiny Delois, that he had a pint of good whiskey in that suit pocket when the picture was made. Arthur later married Lucy Bell Hatcher and became a circuit preacher establishing several churches in the Oklahoma area. His days of riding horses in to church meeting and falling from circus poles faded away to a life devoted to helping others and raising a fine family. So how did Arizona Evans end up with Mr. Curbow – 10 years her senior?? 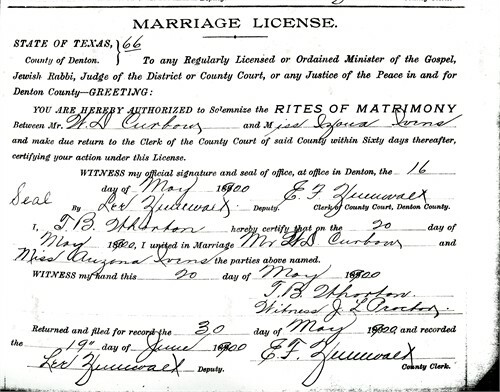 After Arizona’s death, William married Laura Alice Housden on 11 May 1902 in Denton County, Texas. 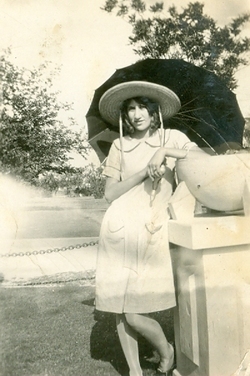 Laura Alice Housden was born in July of 1881 in Missouri. She was the daughter of Andrew John Housden (1843-1895) and Ellen W. Wilhite (1849-1908). It appears that the Housden family was well-established in the Denton County area, although I can’t find much on Laura specifically. She had been married once previously (James Robert Graves Stewart) and had a daughter with him named Ollie L. Stewart who was born July of 1899. It appears that this first marriage ended in divorce. 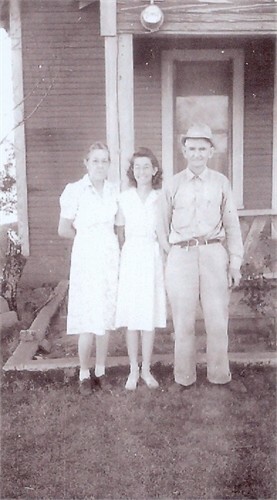 William and Laura had one daughter together that I am aware of – Mattie J. Curbow who was born in 1906. Unfortunately, based on some postings that I found on ancestry.com, William and Laura had divorced by 1915. I have no information on what happened to William, Laura, Ollie or Mattie after this time period. Laura apparently remarried because she is buried in Bellevue Cemetery as L. A.”Pope,” and is listed as “Pope” in her brother’s obituary. I have no information on what happened to the two girls, Ollie and Mattie. 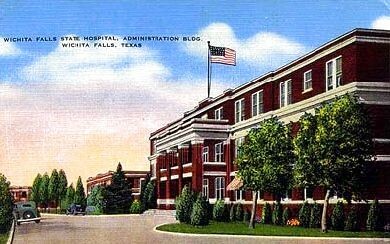 The Wichita Falls State Hospital was for the insane but not necessarily for the criminally insane. While I am very curious to know why William was in “an insane asylum,” it should be noted that in years past, people were committed for a myriad of reasons, including drug addiction, alcoholism, deafness, epilepsy or even senility. A recent request to the Texas Attorney General’s Office for a release of William David Curbow’s records has been denied for privacy reasons. The death certificate indicates that William David Curbow was buried in Henrietta, Clay County, Texas. The Hawkins Mortuary Index contradicts this information and states that he is buried in Bellevue. 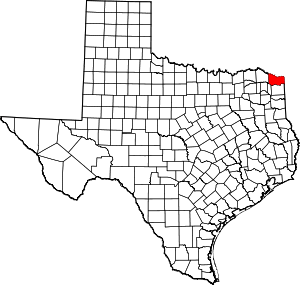 It has been confirmed through the caretaker that William David Curbow is indeed buried in Bellevue Cemetery in Bellevue, Clay County, Texas – and not in Henrietta. His gravesite is known, but has no marker. I would be interested in hearing from anyone that knows anything more about William David Curbow or who is researching the Evans and/or Housden families, and would particularly love to know what happened to Ollie Stewart and/or Mattie Curbow. And most of all – my heartfelt thanks to Rich Mercer – for sharing his family story and for solving the mystery of the beautiful Arizona Evans. Orlando Grantham was known to his family and friends as “Lando.” He was one of the sons of Hillard Cisero Grantham and Margaret Dickson. According to his headstone he was born on 15 Oct. 1881. Several of the other trees on ancestry.com list his birth location as Hill County, Texas. I think this is possible as his brother Jess’ death certificate lists him as being born there also. For the most part Lando grew up in Callahan County, Texas. Lando was my husband’s great grand-uncle. On 7 Mar 1906, Lando married Maude E. Windham. Maude was the daughter of Calvin Windham (1887-1909) and Martha Alice Smith (1861-1939). Technically, Lando married his future step-sister. Yes, you heard me correctly. Late in their lives – after their respective spouses had died – Lando’s father, Hillard Cisero Grantham – and Maude’s mother, Martha Alice Smith married. In mid-December of 1908, Lando and Maude had a son – he died one month later. Tragically, Maude died about two weeks after the death of her son. It can only be assumed that something went wrong with the delivery of the baby or they both contracted an illness. According to the marriage books in Callahan County, Texas, Lando did remarry – on 13 Nov 1911 – to Myrtle Counts. Several of the trees on ancestry.com have her listed as “Myrtle White.” I have no other information on Myrtle. It appears that Lando and Myrtle had at least one son – Orlando Grantham, Jr. (1912-1983). Orlando, Jr. (according to the Texas Birth Index) must have married – Thelma Josie Amundson. This couple had at least two sons: Marion Grantham, born 1939, named after his uncle; and Orlando, III born in 1941, named after his father and his grandfather. Tragically Lando Grantham died at the age of only 32 years old on 15 July 1914. His cause of death is not known to me, and I have not been able to locate a death certificate. Little more is known about this family group. I would like to be in touch with other Grantham researchers that might know the history of this family and who could help fill in some of the gaps for me. Lando and Maude and the infant son are all laid to rest in Tecumseh Cemetery in Clyde, Callahan County, Texas. Laney Belle Atwood was my husband’s first grand-aunt. She was born on 2 December 1885 in Stephens County, Texas, one of the daughters of William Payton Atwood and Ellen Elizabeth West. By 1900 she was in Callahan County, Texas with her family. Nine years later on 2 Jan 1909 at the age of 23 she married Joseph Leland Staley (1885-1966) in Abilene, Taylor County, Texas. Laney and Lee had two children: Frieda Corrine (1910-1975) and James Leland (1916-1976). Wanda Atwood Hollis has fond memories of her Aunt Laney: It used to seem like a day’s trip, and WAS , for us to go to Aunt Laney’s for the day! She had a rock fish pond with fish in it. Of course, the house was old and sparsely furnished…but she and cousin Frieda did the most beautiful handwork – crochet…they made big bedspreads and beautiful quilts. Mrs. Straley Dies; Oplin Rites Slated: Mrs. Laney Belle Straley, resident of the Oplin community for about 5 years, died at 9 p.m. Sunday at her home residence at Oplin after a long illness. She was 73.; Funeral will be held at 2 p.m., Tuesday at the Baptist Church at Oplin. Burial will be in Oplin Cemetery with Wyllie Funeral Home in charge. Born Dec. 2, 1885 in Stephens County, she married Lee Straley, Jan. 1, 1909 at Abilene. She was a member of the Baptist Church. Surviving are her husband; one son, Leland Straley of Austin; one daughter Freda Straley of Oplin; three brothers, John Atwood of Lubbock; Claude Atwood and Gene Atwood, both of Abilene; two sisters, Mrs. Ches Barr of Cross Plains and Mrs. W. E. Jones. One of the long-time Curbow family researchers that I’ve been in contact with believes that Henry was one of the sons of John Corbo and Ann Phillips, and I concur. Born around 1770, Henry Curbow can be found in various census records (see detail below). Additionally, there are two early marriage records in Richmond County, Georgia for what could be Henry Curbow. In 1832, Henry was a winner of a parcel of land in Campbell County which he won in the Georgia Cherokee Land Lottery. Most interestingly, later in his life, Henry can be found in the 1846 tax rolls of Bowie County, Texas, and he appears on the Federal Census Mortality Index as having died in Cass County, Texas in May of 1850. Cass County is directly south of Bowie County – and in fact Cass County was organized in 1846 out of land from Bowie County. This connection has piqued my interest. Bowie County is where I believe Tilman Curbow’s family (my husband’s ggg-grandfather) spent the Civil War years; where Wiseman Curbow lived a good portion of his life; and where Henry B. Curbow, Jr. bought property in 1852. Wiseman was in Texas by 1850; Henry, Jr. by 1852; and Tilman by the mid-1860s. Could it be that Henry Curbow, Sr. set out for Texas – and his sons followed? Some of my further notes include the following: According to the various census records, Henry Curbow was born sometime around 1770 in North Carolina. Several of the trees on ancestry.com indicate that he was born in Wadesboro, Anson County. While the Curbow family of that time did have ties to Anson County, I have seen no documentation linking his birth to that location. Any folks out there have a source for that? The following men could possibly be brothers of Henry B. Curbow: John (1755-1839); Joseph (1755-1850 – revolutionary war soldier); William W. (1757-? – revolutionary war soldier); Samual M. (1764-? ); Solomon David (1776-1847); and Hezekiah M. (1780-?). In 1790 there is a Henry Carboe living in Edgefield County, South Carolina. There are seven people in his household – 1 male over 16; 1 male under 16; 5 females and no slaves. In 1800 there is a Henry Kerbow living in Barnwell, South Carolina. There are six people in his household – 2 males under 10 (Joseph & Ezekial? ); 1 male 10-15 (James? ); 1 male 26-44 (Henry); 1 female under 10 (Mahala? ); 1 female 16-25 (wife) and no slaves. In 1809, Henry Curbow can be found in the Tax Rolls (Page 91) of Jackson County, Georgia. On 29 Jan 1816, Henry Curbow purchased land in Jackson County, Georgia. A James Curbow signed the Deed as witness. I don’t know the family connection – his oldest son? Brother? On 9 May 1817, a Henry Caribo married Elizabeth Mason in Richmond County, Georgia. Richmond County borders Edgefield County, Georgia. On 25 Mar 1818, a Henry Caribo married Nelly Stidman/Steadman in Richmond County, Georgia. In the 1820 census he is indexed as Henry Curbow – and he is present in Gwinnett County, Georgia. No detail provided. In 1832 Henry Curbow was a winner of the Cherokee Land Lottery (No. 20 and No. 307 in District 9). He won “fractional lots” in Campbell County, Georgia. By 1846 Henry Curbow is in Texas. He filed a Claim against the Republic of Texas; however, the facts and details of that are not yet known. Additionally, in 1846 he can be found in the tax rolls for Bowie County, Texas. Henry Curbow, according to the 1850 Mortality Census Schedule, died in May of 1850 at the age of 80 years. His cause of death was listed as “inflammation of the brain.” Meningitis? Encephalitis? The Schedule confirmed that he was born about 1770 in North Carolina, that he was married; and that he was a farmer. If the trees on ancestry.com are to be believed – and I urge you to do your own research – then Henry Curbow had his first child in 1790 when he was 20 years old and his last child in 1844 when he was 74. While this is entirely possible, the younger children, as stated above, are probably his grandchildren – and he was probably married more than once. And that is about all I know about Henry Curbow at this time. I’ve been in touch with folks that are connected to Seaburn Curbow (these descendants spell their name Kerbo); and with descendents of Lydia Curbow. Please contact me – and let’s brain storm over Henry!